RUSH: Now, on Sunday, the New York Times had a story that is an attempt, was an attempt to drive a wedge between me and those of you in my audience. The attempt was to imply, because they cannot state it, the attempt here was to imply that I am a secret, clandestine operative for the Gang of Eight bill and amnesty. The story was written in such a way as to make it look like I am a secret supporter and that I have kept relevant information from you and that I am secretly trying to push this bill across the finish line. Now, the story couldn’t say that because it hasn’t happened. The story didn’t say that because it’s not true. So they did their best to imply it, to insinuate it, so that people might infer this was going on, because the New York Times knows that many people are suspicious of anybody and everything in politics, that nobody’s honest and nobody’s straightforward with them anymore. And that the first minute, the first notion they hear that somebody isn’t who they claim to be, they know people will glom on to it and perhaps believe it. And the reason that they tried to make this story believable or the vehicle they used is something that I have referenced, but never specifically detailed for you, on this program. Before even beginning the discussion, I want to play two audio sound bites to help put this in perspective. Because I am not going to sit here and be placed on defensive about it. It’s just patently absurd to suggest that I have in any way and at any time, either clandestinely or openly, supported amnesty. MILLER: First of all, letÂ’s remember the warning of Rush Limbaugh, who said that, if Rubio is president, within 12 to 18 months the entirety of the donor class agenda will be implemented. Mass immigration, open borders, amnesty, TPP and even more globalist trade deals, and the destruction of US sovereignty. Understand, everyone listening today: There is a point of no return. It is not far away. It is right in front of you. And, if you cross it, there is no going back. RUSH: The beginning of that bite, “remember the warning of Rush Limbaugh.” There is, by the way, nobody who can find anywhere at any time me supporting amnesty. This is just so preposterous, either directly, indirectly, openly, closedly, there is no way anybody can ever do it. I think it’s a sign of the desperation that some are in. The real question is why hasn’t Gang of Eight passed? You look at all the powerful forces arrayed trying to get it passed, why hasn’t it? 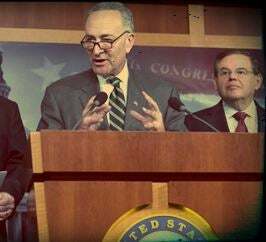 Why isn’t the Gang of Eight already law? Why isn’t amnesty already the official law? I’m not saying it isn’t happening with Obama’s executive orders and actions and so forth, but why is the Gang of Eight still up in the air, why has it still not happened? If there are all those powerful forces arrayed trying to make it happen, including me and others in talk radio, why hasn’t it happened? “First of all, let’s remember the warning of Rush Limbaugh, who said that if Rubio is president –” does that sound like somebody warning you or pushing amnesty? Now, let me go to the real quote, because what I was talking about, this is October 22nd of last year, and I was discussing and informing you about the Republican establishment plan for enacting its agenda and what I had learned and then passed on to you was what the establishment Republicans were hoping to make happen. RUSH ARCHIVE: I’m telling you the House leadership thinks it’s gonna be Jeb or Rubio. The dream: Jeb or Rubio in the White House; Ryan Speaker of the House. Then in the first 12 months of the Rubio or Jeb administration, first 12-to-18 months, the donor-class agenda is implemented, including amnesty and whatever else they want. That is the objective here. That’s what I think all this adds up to. Just guessing. … [M]y scenario about what’s going on with Ryan and the Speakership and how this is actually a script that’s been written for many, many days here, long before we first hear about it. I mean, the dream is, from the establishment point of view, that if Jeb Bush — or somebody else, if he is not able to pull it off, that he’s elected president — got Paul Ryan as the Speaker, and in the first 12 to 18 months the donor class agenda gets implemented, including amnesty. I do not doubt that is what they want out of winning the White House. RUSH: Right. Now, back to… This is back in October, and they’re still very mightily behind Jeb. Jeb is still… He’s not performing well. He hasn’t ever performed well. Never did. At this time in October he hadn’t, either, but they still had all their eggs in the Jeb basket. Their backup plan was Rubio. And here I am warning everybody against it. I’m not advocating it, and certainly not pushing it. But the attempt by the New York Times nevertheless to drive this wedge between you and me — and not particularly so much you. I mean, you people that listen every day know it’s preposterous. But there are people that don’t. People that don’t, who support one candidate or another and who believe any conspiracy theory that comes down the pike — particularly if they’ve been pre-set up to expect people to disappoint them, to lie to them, to defraud them or what have you. It’s happened so much at the Republican establishment level that people have come to expect it, which is one of the reasons why the establishment is in circumstances they find themselves. But the New York Times somehow found out about a dinner that I was asked to attend. They reported the fact that the dinner had occurred. They had few, if any, details of the dinner, but they didn’t care. All they had was the dinner, and they were able to use just the fact that it had happened in order to try to create this wedge between you and me. In fact, the New York Times even notes that. It was last week; we had a caller upset with me that I was not supporting Rubio. I said that last week. This is my first reference to this dinner. Now, I have mentioned on several occasions how powerful forces and powerful people have been dispatched to me to try to convince me that I’m wrong about amnesty, that I need to see it in a different light. The George W. Bush White House, on two separate occasions, sent emissaries to me to try to explain to me that it wasn’t “amnesty” and what it really was, their support for amnesty and immigration. And I’ve told you that a number of times. I’ve gotten to the point now that I joke about it. A number of times the Bush White House sent emissaries to me — actually to my home — to try to talk me out of my opinion on amnesty, out of my opposition to it. And the Bush administration efforts were always focused on, “This is how we save the Republican Party. If we succeed in this…” This is what I was told. “If we can do this, we make the Republican Party the dominant party for the rest of our lives,” and that was always the way it was pushed to me. That was always the angle that was taken to make me support it. And I — to their face, just as I did in this dinner that I will detail in a moment — expressed my opposition. I told them I didn’t see it the way they do. I thanked them. I was civil. I was polite. I didn’t yell at them, jump down their throats, or anything of the sort. I was flattered and gratified they would take the time to come see me personally. I was polite as a result. I was civil as a result, as I have been with Senator Rubio on the phone here, as I have been with Senator Cruz and everybody else who has ever called this program. Romney, George W. Bush, George H. W. Bush, Bob Dole, you name it. Any candidate who’s ever called here, I’m polite and civil. And I’ve routinely said to each of these emissaries, no matter where they’ve been (in order to make my point, in order to let them know that I’m not buying what they’re selling), “I’ll gladly, openly support your amnesty — happily so — if you will guarantee that none of those being granted amnesty can vote for 20 years.” And not a single person trying to sell it would even entertain the idea. Which I knew, because the whole purpose of amnesty is it’s a Democrat voter-registration program. The Democrat Party needs its permanent underclass. In the pre-Obama economy, people in the lower-middle class and the middle class had opportunity to lift themselves, to change their economic circumstances, to go from lower economic middle class to middle class to upper-middle class and beyond. With the advent of the Obama economy, that movement has becoming stagnant. Nobody’s moving upward at all. Everybody’s stagnating or declining because of the Obama economy. But prior to the Obama economy, the Democrats needed to replace people who started improving their lives. Because as people improved their lives, they became less dependent on Washington, less dependent on the Democrats. Ergo, you need a constant influx of low-wage, low-skill, low-educated people who have no choice but than to depend on government to live, the permanent underclass. The Democrat Party cannot thrive or survive without it. And in an effort to establish that all this is is a voter registration drive by the Democrats, I have said, “I’ll be glad to support you — in fact, I’ll become one of your loudest voices — if you’ll put in the bill that these people being granted amnesty will not be made citizens for 20 years and thus cannot vote.” And not one advocate would even entertain the idea. Nor did I expect them to. Because I know what this is. I have known forever what this is. It’s what this was in 1986 with Simpson-Mazzoli. Who says we can’t? We did six million with Eisenhower. If we have the will, there’s a way. RUSH: So the Democrats, ladies and gentlemen, can see their goal is within their grasp if they can just accomplish giving these 11 million — or probably twice that, really. Let’s call it 11 or 12 million, these illegal aliens. If they can just somehow get them the vote, then whatever else happens, it’s over. It’s ballgame. And make no mistake: That’s what this is about. It’s what amnesty has always been about, which is why I’ve never understood (and have said so) any Republican favoring it, which led me to figure that out. It actually hit Saturday night. It was for the Sunday paper. And it begins with the story of Chuck Schumer wanting a dinner in the executive dining room at Fox News with Roger Ailes and Rupert Murdoch, which apparently happened. Then the story says that Ailes and Murdoch told Schumer that, “If you really want this to happen, you need to reach out to Rush Limbaugh.” None of this was known to me at the time it was happening. But they did reach out, and I was invited to attend dinner with these people. RUSH: All right. Now, you all know how much I really don’t like making this program about me, particularly from the beginning. But I want to do this and get it out of the way. Reading here from the New York Times on Sunday: “Their mission…” Chuck Schumer, and I guess it was Rubio. Schumer and Rubio. “Their mission was to persuade Rupert Murdoch, the owner of [Fox News], and Roger Ailes, the chairman and chief executive of its Fox News division, to keep the network’s on-air personalities from savaging the [Gang of Eight] legislation and give it a fighting chance at survival. It’s not an “anti-immigrant” base! It’s about the rule of law. It is about illegal immigration, not “anti-immigrant.” The base of the Republican Party is not anti-immigrant! But I digress. “So the senators [Schumer and Rubio] supporting the legislation turned to Mr. Rubio, the Florida Republican, to reach out to Mr. Limbaugh,” and this is where it breaks down. I was indeed invited to attend a dinner in New York on I think it was… Well, the dates are running together. When was the…? It was March 9th, 2011, five years ago now. I was invited. I got a call from Mr. Ailes, who is a friend of mine, and said (Rubio was not even part of this), “Lindsey Graham and Chuck Schumer would like to invite you to a dinner we’re going to about immigration reform.” And he gave me the details of where it was, and I accepted. I would have been a fool not to. It was a learning opportunity. It was many things. So I attended. It was at The Palm in New York, and I have no idea how this leaked. But I was asked to keep it off the record, and did, because nothing happened at this dinner that was unexpected. But I’m gonna give you the details of what did happen here. I want to properly characterize this for you. There was no pressure from anybody when I got the call and the invitation to attend the dinner, and they were very up front about what it was. Schumer and Lindsey Graham. Rubio was not part of this dinner. Rubio’s name had not been mentioned to me in any of this. This was Chuck Schumer and Lindsey Graham wanting to explain to me and Rupert Murdoch what their legislation was all about, the intimate details of it. And they went through it step by step — E-Verify, all of the mechanisms by which illegals were gonna be “brought out of the shadows” and be given identification cards and have to leave the country, come back in, get back in line, whatever it was. There wasn’t gonna be immediate citizenship. There wasn’t going to be amnesty of any kind. And they were hell-bent on me understanding it. I was polite, and I was civil. And by no means was this the only thing discussed. There were all kinds of other things. I’m sitting there thinking, “You don’t care about the Republicans winning the White House again. You’d be perfectly happy if they never did.” And at some point in the dinner, I mentioned my little joke about, “Hey, you guys guarantee they can’t vote, and I’m all in.” No response whatsoever. The thing lasted about two or three hours, with immigration nowhere near the only thing discussed. I had a lot of takeaways, realizations, things that were being said by people that were surprising and shocking to me, but none of it about immigration. I was shocked at how well Schumer and Rupert Murdoch knew each other, but then I said, “Well, it makes sense. Rupert lives in New York; he runs a major business empire that interacts with politicians every day. It would make sense he knows Schumer.” But Marco Rubio was not part of this. Marco Rubio… My memory is Marco Rubio’s name wasn’t even mentioned at this dinner. Nobody asked me to take phone calls from Marco Rubio. Nobody asked me to give Rubio some airtime. Nobody asked me anything about Rubio. Well, I have manners and I had agreed that it was off the record. And frankly, folks, about the only thing that there would have been to tell you would have been the following: “Hey, folks, guess what happened last night? A couple of senators tried to talk me into supporting amnesty, but I told ’em no.” That was the upshot of the dinner. But for me, it was an opportunity to learn up close and personal who these people are, how they approach, how they sell, how they attempt to persuade. “Oh, okay. Okay.” There was nothing contentious at any time. It was friendly, convivial. There was nothing argumentative about it in any way, shape, manner, or form. Now, I’ve told people here at the staff of this dinner. It’s not that I didn’t tell anybody. I don’t know how the New York Times learned of it, but we had the caller last week upset with me for mischaracterizing Rubio’s immigration position, and the Times against referenced this call. I did say to the caller, “Look, I’m sorry, what you’re talking about comes right out of the Gang of Eight,” and I heard it from no less than Senator Schumer. Well, apparently, bells and whistles went off at the New York Times, and that’s all they needed to go ahead and write confirmation of this dinner that had taken place. But that’s all there is to it. There have been any number of such meetings I’ve had over the course of my career with politicians of all stripes about issues, left and right. And I have not made a practice of divulging details when people have asked me not to, hoping to keep lines of communication open. Just the way I do it. I’m not into defrauding people or lying to them. “Yeah, yeah, don’t worry, I won’t say a word,” so they’ll open up to me and then blab it. I hear it all — and I’ve used, by the way — there’s no way you would know this — things that were said at that dinner, things that were discussed, I’ve used it in discussion of this issue ever since the dinner happened. I’ve just not credited actual events at the dinner as my source, but I have used the information I learned, and that’s the value of it for me. But they were polite. They were outgoing. They even followed up. They followed up with e-mails and invitations to other things, which I didn’t do. This was it. I didn’t take ’em up on any further golf outings that were suggested or whatever. This was it. So what’s going on here with this story is obvious. The New York Times is attempting to further cloud the Republican presidential race, and they’re trying to make it look like Republican voters are justified in thinking that they’re being lied to. However, they’re now trying to move the discussion from the establishment lying to them to the actual candidates they’re thinking of voting for lying to them. When you talk about amnesty and so forth, I’ve been as explicit as I can about this. If you have, in this presidential race, of all the Republicans in it, there have been two that you could guarantee would never sign on to amnesty. One was Ted Cruz and the other would be Trump. And you say Trump based only on what he’s saying as a candidate, building the wall, all of these things. All the other candidates, none of them will come out and say as definitively as Ted Cruz has. Rubio has the Gang of Eight problem that hasn’t gone away. People continue to raise questions about it. And I realize that one of the efforts that the New York Times made in this story was to make it look like the Schumer and Grahamnesty effort had been successful because I went easy on Rubio thereafter and enabled Rubio to come on this program and sell the Gang of Eight, and I didn’t argue with him or shut it down. In fact, I complimented him. They printed a quote from a subsequent interview I did with Rubio on this program, and, as usual, the quote is out of context, and it does convey what they want you to believe. That Schumer and Grahamnesty hit me up to go easy on Gang of Eight, then Rubio gets involved in the program, and I went easy on him and didn’t stand up to him, and thereby they succeeded in taking me out as an opposition force. Nothing could be further from the truth. Last night I went back, I looked at, we went to the archives of the program back in that era, five years ago, found the relevant transcripts to share with you today should this come up further. But the point that the New York Times tried to make is that I went easy on Rubio. Not true. I had interviews with him, I was civil again, I was polite, because that’s just my philosophy in doing this program, particularly if I’m gonna invite people on, I’m gonna be polite on them. I’m civil. I thought that’s what everybody wanted in our politics anyway. RUSH: Just one more thing here and then we’re done with this, unless any of you want to ask questions about it, but this is it. All of this began in March of 2011. That’s when the dinner I had with Schumer and Grahamnesty and Mr. Ailes and Murdoch happened. Some days later, Rubio did call and ask to come on the program. He came on the program. I was polite to him. I was doubtful. I praised his conservatism and his courage. Remember, this is five years ago, Tea Party. He’s the hot, young conservative, gonna take everything by storm. He had a lot of people supporting him and so forth, and I was complimentary in that regard. We’ve just brought them out of the shadows. We have just put them on the path to citizenship here. “But they’ve been here, they’ve been paying taxes, they have been discriminated against, how in the world could we have screwed up and not given them the right to vote?” And within two days I said — and the New York Times didn’t publish this half of the quote, I said within two days Schumer and the rest are gonna be demanding that we add to the bill by granting them the right to vote, ’cause they’re making a big deal how it wasn’t gonna be part of the Gang of Eight to begin with. But my point was, after talking with Rubio, that none of this fooled me because all that was gonna happen was a two-day delay and then they push for the immigrants being granted the right to vote because that’s all they care about in this whole process in the first place. RUSH: Folks, I actually misspoke. The dinner that I was invited to and attended was in 2011. The interviews with Rubio on this program were 2013. It sure took a while for Schumer’s arm twisting to work, didn’t it? Two years! Rubio was never part of that dinner. His name was never mentioned. RUSH: Look, I know, I know. Some of the Rush-hating trolls out there on Twitter and Facebook? They’re out there saying, “I don’t care what Limbaugh says! He still attended the meeting, and that means he was compromised.” Compromised? Really? The whole point is: If I’d been “compromised,” that’s what the New York Times story would be! That would be the story; that isn’t the story. Their attempts to persuade me did not work. Their attempts to persuade Rubio did work, apparently. But not me. Snerdley just said during the break, “You gotta spell this out for people.” Uh, okay. I’ll give this one little splash here, and that’s it. I am a powerful, influential member of the media. I do not have guests on this program. There are rare exceptions, and you know who they are: When a president calls, a vice president calls. Sometimes you would not believe — and I’m not complaining. I’m just informing you. You wouldn’t believe. I hear from every author. Every author wants to come on. Every author wants me to plug their book. I’m not complaining. It’s the way the world works. I never call anybody else and ask them to plug my book, though. I never call anybody else and ask them to plug my show. But they’re all calling here. There are even some people out there ragging on me over this, who routinely call here every time they’ve got a new book or call and ask to come in here and be on the air to talk about their new book. And I don’t do it because I do not want to give up precious time that I have with you. I said the other day, “I don’t know when people have time to squeeze guests into their shows anyway.” But I’ll just tell you… I’m gonna mention this: Way, way back 28 years ago when this program began, when I started this program, I explicitly decided to do it without guests, to stand out. Every show in the world has guests because that’s just the way it is. And when I started doing this in Sacramento, they made me try to have guests, or tried to make me. And I resisted all of awhile, because it didn’t take me long to figure out because the guest had no real interest in my show succeeding. My show was just the next in an endless parade of appearances for them in order to sell their books or whatever. And I asked myself, “Why should I give over a half hour here and a half hour there to somebody who really is not invested in this show working, who only wants to use it?” And then I said to myself, “When they’re gonna be on every other station and every other show, why should I join that parade?” I wanted to find out if I could be the reason people would listen to the radio, not an endless parade of guests, ’cause I can’t get any better guests than anybody else. And since I don’t care what other people think, I’m a lousy interviewer to boot. I don’t like it. I couldn’t care less about it. I know what I think, and that’s all I need on this show. And then there were other programming aspects to it, too. But, you know, everybody else does it. “Why should I join the parade? They don’t care about the show as much as I do.” So it just got established: I don’t do it. And I very much appreciate it because that way I’m not obligated to anybody. I don’t want anybody obligated to me. But there are people out there (and you know who they are) who are ragging on me about this and have no idea what they’re talking about, who are part of this crowd that’s constantly asking me. And I have promoted their books. And I have attempted to help them with their stuff. So it’s not just Senator Schumer that calls and it’s not just these people. I’ve told you: Mitt Romney’s been by here twice. Rand Paul’s been by here. I’ve talked to Rubio. I’ve had these people on the radio now and then. When I decide that it’s interesting for me to have them on the radio, that’s when I decide to do it. Not because of a sense of obligation. Not because I think you want to hear from ’em. And that kind of thing would be said. So that’s that. And, again, just to correct — not correct, but to illustrate — one thing, one more thing. The dinner that I had with Schumer and Lindsey Grahamnesty was in March 2011. I had Rubio on this program two years later. So that arm twisting they did, yeah, that the New York Times says happened? That was really successful, wasn’t it? It took ’em two years. Rubio on this program had nothing to do with that dinner. His name never came up; he was not part of it in any way, shape, manner, or form.